A vertical garden can have so much to offer. If you are low on space, or just want to use all of the space that you have, a vertical garden is a great option. I'm going to go over all that you need to know to build your very own vertical garden. I'll discuss how to build a vertical garden, supplies needed, random vertical garden ideas, plants to grow in a vertical garden and some pros and cons of a vertical garden. There are so many vertical garden ideas, and some I will go over later in this article. Because of the many different kinds, the way you build one will depend on what kind yours is. I'm going to go over the instructions on building the most common type, the framed vertical garden. So let's get started on learning how to make a vertical garden frame. Before we learn how to make a vertical garden frame, you must first pick a wall you would like to build your frame on. Some people enjoy having a vertical garden on their porch, on the side of their house, on their fence, or even indoors. Make sure you choose a place where you can easily get to your plants. Also make sure that your wall can hold the weight of a vertical garden. Now it is time to get building a vertical garden. Building a vertical garden is very easy. You have three choices of material you can use: wood, 3/4-inch PVC pipes, or metal. It is recommended not to use wood or metal, as metal will add additional weight to your wall and wood will need treated to prevent rotting. With that being said, a metal grid is an easy option since it is already made for you. 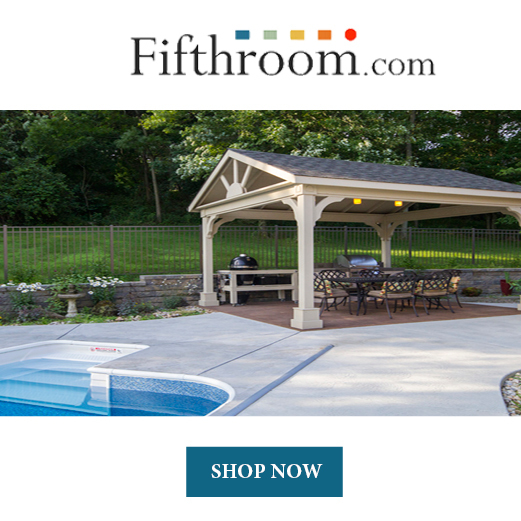 If you decide to use PVC pipes, you will need to also buy elbows and four-way joints. You can build this frame directly to the wall, but it is easier to build it off of the wall and then attach it later. That way, if you ever needed to take the vertical garden down, it wouldn't be permanently on there. You will need to use 2 pieces of fabric and one plastic sheet. The plastic and fabric should be the same width of the frame, but you can have them slightly longer in length. Attach the plastic to the frame by using screws and staples. Make sure they are secure and tight. Attach the fabric in the same way. All plants need water in order to thrive. But with a vertical wall, you cannot simply take your watering can and water them. An irrigation system is the best option to use. To make an irrigation system, use poly tubing with fittings that lock. 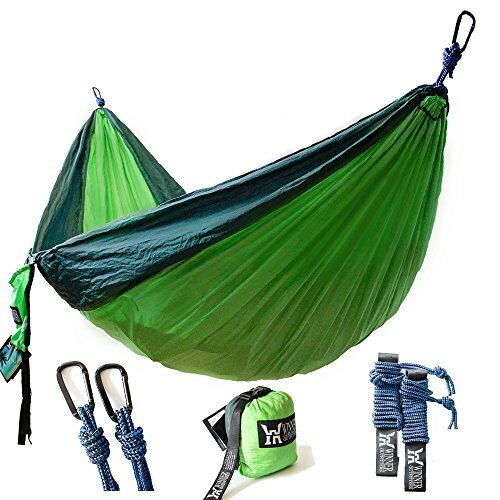 This setup is basically a tube running across the top of your frame. It will have emitters that drip down. You could also use a standard valve and irrigation drippers, but for this you'll need a propagation timer that can be set for seconds rather than minutes. You will want the water to quickly flow for 10 to 15 seconds from three to 6 times per day. Attach your irrigation system to a water source. You may want to filter the water with an irrigation water filter. 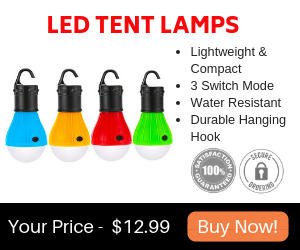 This is cheap and can be bought at any hardware store. Attach a fertilizer injector with an irrigation valve that will send liquid fertilizer into the irrigation system. You are now on the last step to building a vertical garden, which is to attach your frame to the wall. You will want to use stainless steel hardware to avoid rusting. Hooks will work, since this allows you to remove the frame anytime you want. Now, go fill your vertical garden setup with plants. Enjoy! There are so many vertical garden ideas that can make your home look creative and welcoming. From vertical garden frames to hanging pots, each vertical garden idea allows you to save space and still grow plants. I've included a list below of some common and creative vertical garden ideas. Enjoy. 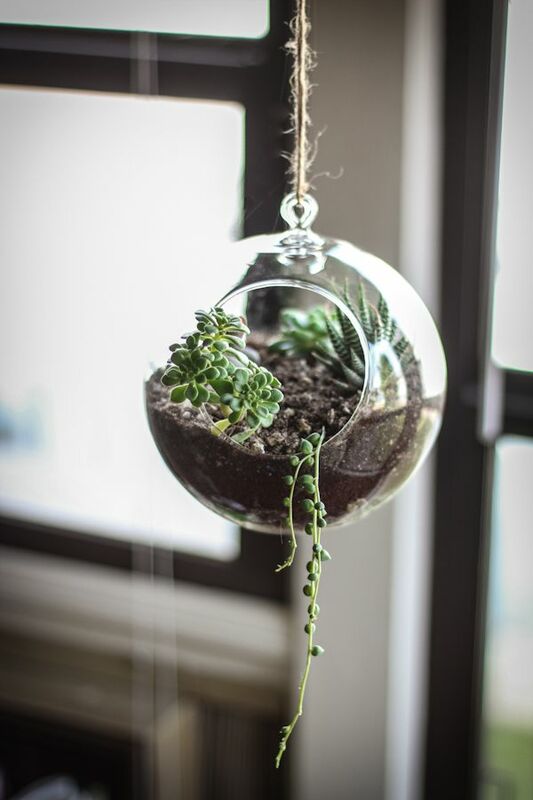 If you do not have much space, yet want to display plants in your yard, perhaps hanging glass orb terrariums is what you're looking for. Succulents are great plants to grow in glass orb terrariums, since they are small. 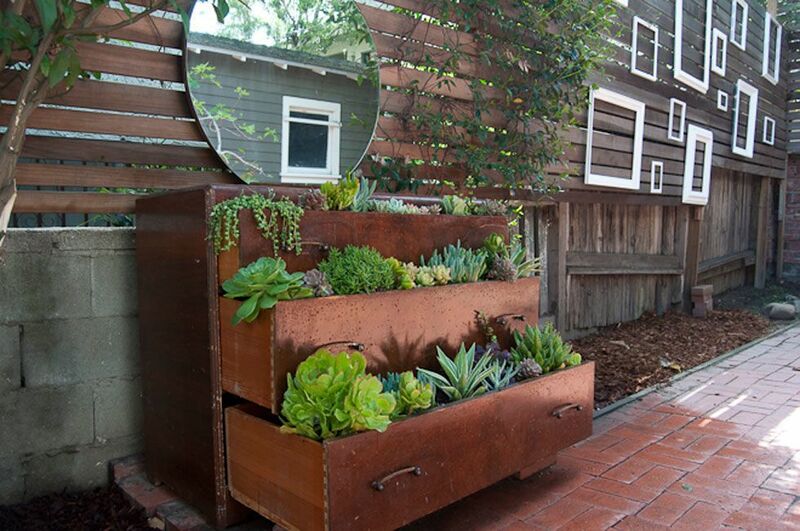 If you have an old dresser, instead of throwing it away try using it for a vertical garden. Each drawer needs to be opened, and the last drawer must be opened the most. This creative way to make a vertical garden is not only cute looking, but it is a great way to recycle a dresser. 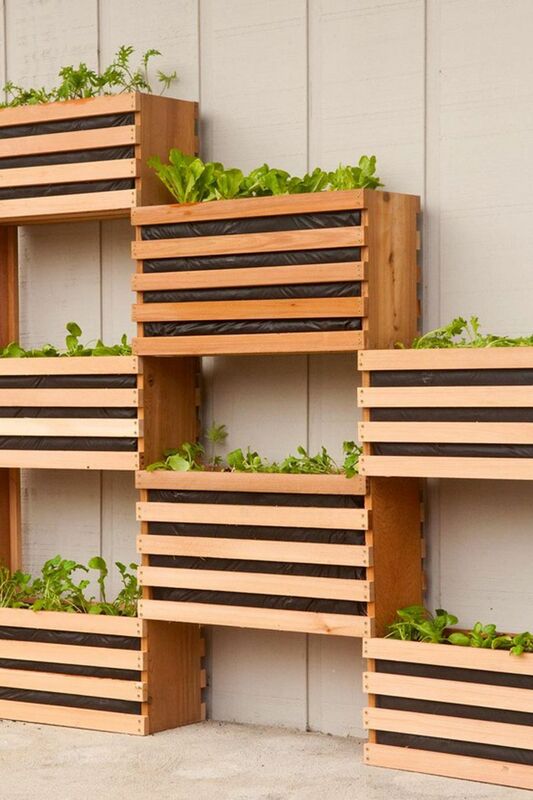 Wooden crates can make a great vertical garden. If you stack them right, each box should have a gap so that the plants can grow. You can either make your own wooden crates, or buy them at a store. 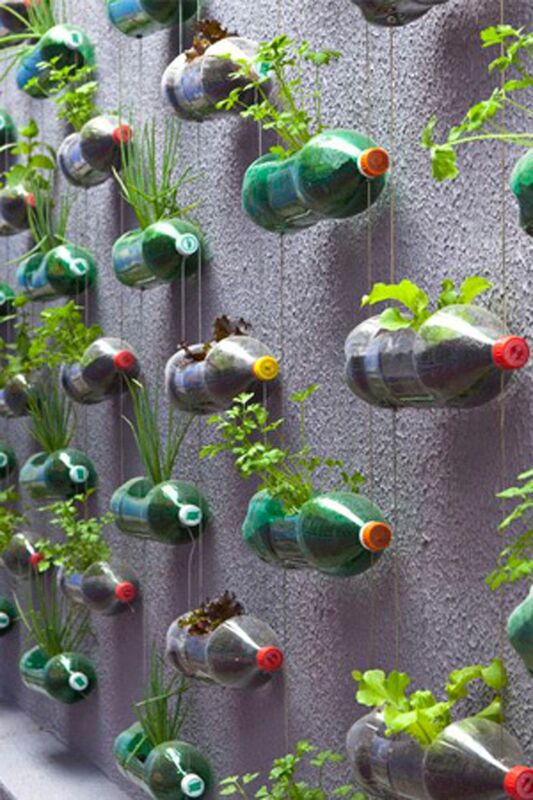 Instead of throwing your soda bottles in the trash, reuse them to make your own vertical garden. Each soda bottle is filled with soil, and has an opening where plants can grow. Each soda bottle is then hung from a clothesline. There are so many plants that can be grown in a vertical garden. From vegetables to flowers, the list of plants is endless. 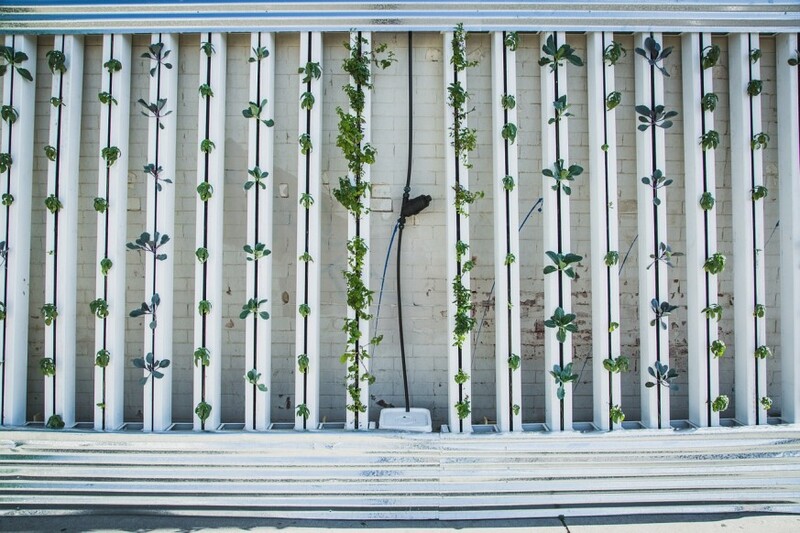 Almost any plant that can be grown in a regular garden can be grown in a vertical garden. 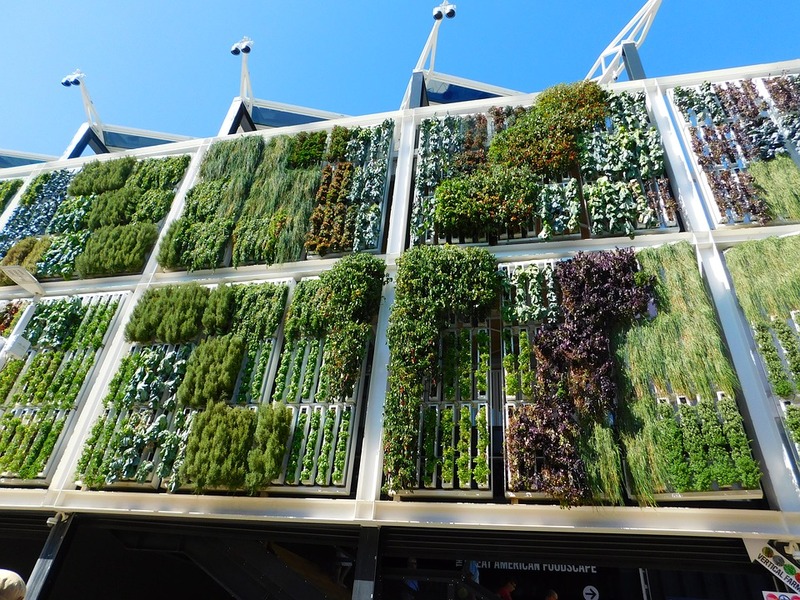 Just imagine that a vertical garden is a regular garden growing upward, which is basically what vertical gardening is. But in case you're still wondering what plants will do extra well growing vertically, I've included a list of plants below. 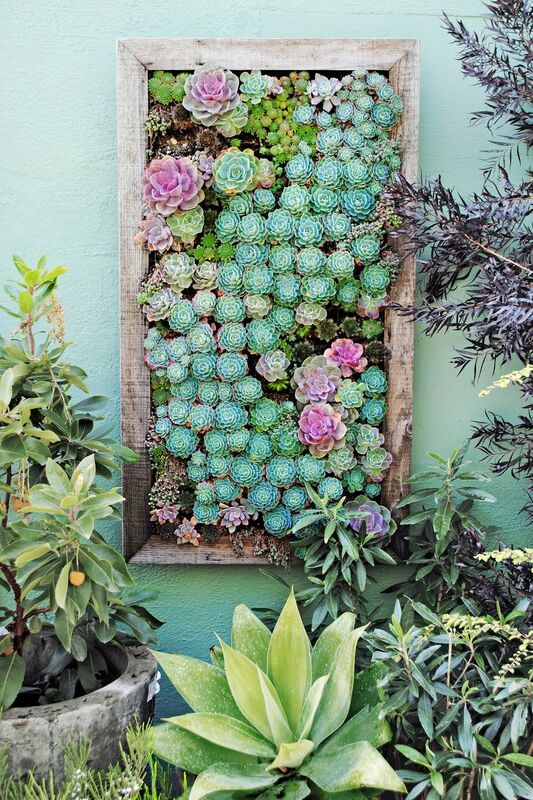 With their small size, succulents can be grown in any vertical garden, big or small. Remember that succulents like a good soaking once in while, not little sips throughout the day. Therefore, your irrigation system should not water your succulents small amounts often. A vertical garden is the perfect place to grow fresh veggies. There are so many vertical vegetable gardening ideas, and some of the ideas I've mentioned earlier can be used for growing vegetables. Lettuce is popular, since it does not take up much room. Potatoes are another popular vegetable to grow. Potatoes are usually grown in a vertical tower, rather than a frame. The nice thing about growing vegetables in your vertical garden is that you will receive lots of produce for you to eat. Similar to vegetables, herbs have a purpose besides just looking nice. A lot of herbs can be added in recipes, some are used for medical reasons, and some reduce your chance of getting an illness such as cancer. Flowers can help brighten up your house, and can be very attractive. For vertical gardening, you will want to choose flowers that have vines. Examples could include the moonflower, black-eyed Susan vine, cardinal climber, cypress vine, or hyacinth bean. If you don't have enough space for a garden, a vertical garden is a great alternative. Whether you're growing flowers or vegetables, vertical gardening can be a great way to save space and still enjoy gardening. One of the biggest cons about a vertical garden is that water will drain out, and therefore get anything underneath it wet. This is especially a problem if you will be having an indoor vertical garden. One way to fix this problem is to grow plants underneath the vertical garden. That way, when the water runs off it will enter the other garden. A planter box is a great option. If you enjoy landscaping and being creative, you will certainly love a vertical garden. While some vertical gardens simply hang from a hook, others grow up onto walls and cover fences. Some can be designed in a way so that they cover your entire house. Although a vertical garden is perfect for those with limited space, a vertical garden may not provide enough space for your plants. Unless your plants do not have large roots, this can be a major problem that can cause your plants to not thrive. As you can see, there are many options to integrating a vertical garden into your backyard. You can customize a vertical garden to meet your space needs and your personal taste. I hope I've motivated and equipped you to start building your own vertical garden today.